Welcome to Day #9 of Chocolate and Surprise Theme Week. 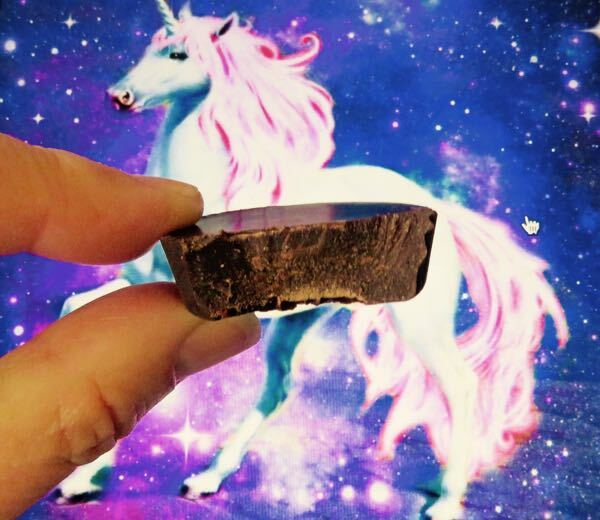 How about a chocolate with a golden unicorn mascot? That's a little surprising. We've featured chocolates with names that span the entire alphabet; however, we've never run a series of chocolates that corresponded to an animal alphabet. If we did, the letters M (chocolate monkeys and mice), S (chocolate squirrels) and C (chocolate cows and cats) would likely be over-represented, as would T (chocolate turtles). 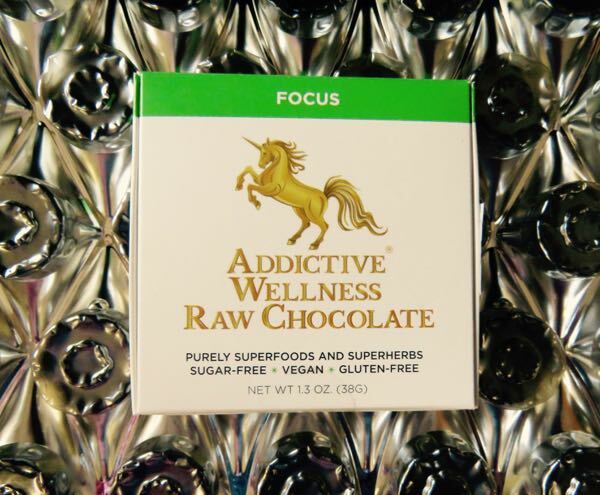 Whereas today's Focus chocolate from Addictive Wellness Raw Chocolate (Beverly Hills, CA) might be the only U (unicorn). The package of four round, peanut butter cup-shaped dark chocolates were made with "beyond fair trade" Arriba Nacional Heirloom Cacao. There was no soft center in these cup-shaped pieces. 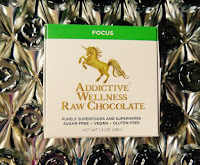 They were solid chocolates that contained Cordyceps, Siberian Ginseng, Lion's Mane Mushroom, Mesquite, Lucuma and Ashwagandha, and were sweetened with Birch Xylitol and Stevia. They were also sugar-free, gluten-free and vegan. The texture was fairly smooth. However, not surprisingly, these "superfoods and superherbs" imparted some taste—a slight bitter, medicinal herb flavor; although it was better balanced than it sounds.